Crashes that occur on the hair is from the nutrition, care, and health. Hair fall is caused by, the stop of hair gland to produces hair, a certain disease, burns in the head, typhus, stress, and others. Tea water (thick) is condensed during the night. In the morning, use it to dampen scalp while massage evenly and leave for a few minutes, and rinse. Do regularly 3 times a week. Take candlenut tree (Aleurites moluccana (L.) Willd) as much as needed, and wash until clean, then pound it until smooth. Add a water and boiled until the oil out. Apply the candlenut oil on the scalp to spread evenly. After a bit dry, do regularly twice a week. Apply an extract of lemon juice on the scalp to spread evenly. After a bit dry, also apply a yolk on the scalp evenly. Bandage/cover your head with a towel during the night. Wash your hair in the next day to clean. Usage: on a regular basis 2 times a day. Soak Cayenne pepper/Cabai Rawit (Capsicum frutescens L.) as much as needed with 75% alcohol for 14 days, the water and then be smeared on the scalp. Do regularly twice a day. Use this herb celery (Apium graveolens L), which is very good to maintain fertility and strengthen the hair roots of hair. Take a Pare leaves (Momordica Charantia L.) that is fresh, washed clean, smashed, and pressed. Use the extract water to shampoo and leave for 30 minutes, and then rinse to clean. This herbal concoction is quite effective to reduce hair loose. 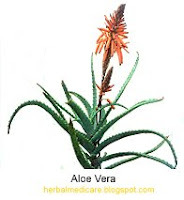 Peel aloe vera leaf, rubbed in the head until evenly and leave for several hours, and rinse to clean. Do regularly 3 times a week. In three months time, the hair fall will look being reduced. Waru leaves (Hibiscus tiliaceus L.) is very good to enrich the hair, strengthen hair roots and reduce the baldness. After washing clean material is prepared, cut into pieces, into the saucepan, add ½ cup coconut oil and ½ cup sesame oil, and heat until boiling. After a cold, filtered. Usage: apply to the scalp while do a message. Do at night before bed and in the morning shampoo your hair. Perform 2-3 times a week. Within two months the hair will look fine and the hair fall/baldness will reduce. Choose one of the above ingredients, for use as an alternative treatment, cure hair fall.